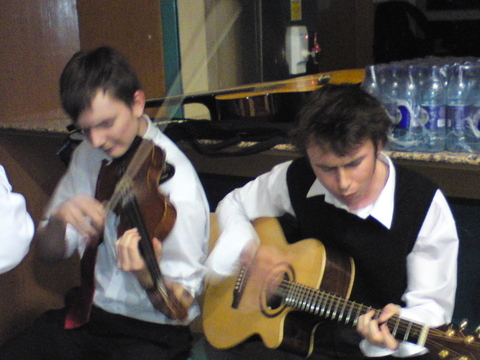 New play-along midi files for NBHS PTA Burns Supper (Fri 4 Feb at 19:00) have been posted on the Guitar Group Midis page. The snow continues leave its white print on school and community life. The original plan for today was to have an afternoon concert (for P7 pupils along with family/friends of performers who couldn’t make the evening event) and the traditional evening concert. Weather and transport difficulties meant that we had to make do with only the former. Nevertheless, the pupils turned in commendable performances. I left my Zoom H2 in the capable hands of Mr. eduBuzz – David Gilmour – who was seated at the back of the hall – already engaged in making a recording, in the hope that some of these performances may soon be able to reach those for whom they were originally intended. 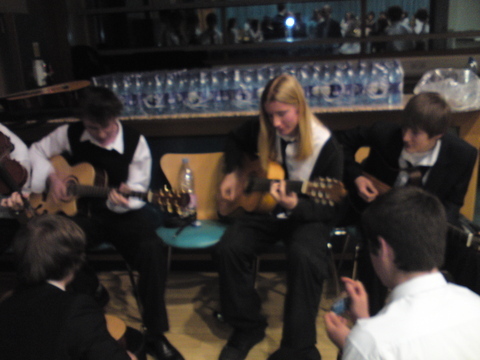 He recorded the two pieces played by the Knox Academy Guitar Group. On reflection, I think the distance was too far, as the rustling of nearby programmes seems to rival the volume of the distant group. Still, I feel that they played very well on the day, despite the pressure of lost rehearsal time. Walking In The Air features the full group (18 members – normally 19 but one was ill today). Maria de Buenos Aires features 6 senior players (S4 – S6) along with one courageous S1 player! Try as it might, the snow did not manage to disrupt this year’s NBHS Christmas Concerts on Mon 13 & Tue 14 Dec. We lost rehearsal time during the week of blanket closures. Even when pupils returned, not all could get in and some of those relying on buses missed another rehearsal. 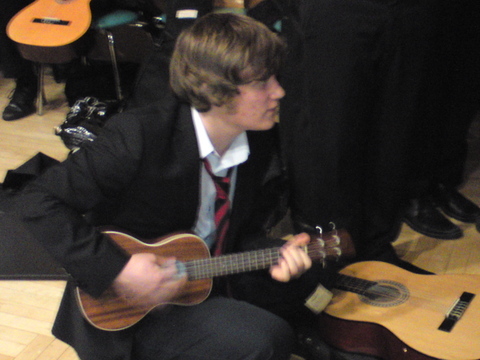 However, thanks to a bit of give and take between schools, some replacement rehearsal time was found and the Guitar Ensemble turned in two of their best performances to date. I was particularly pleased with the sensitive phrasing in the Sicilienne by Paradis – not for the want of my droning on about this topic, I can assure you – still, worth it in the end – I hope you agree. Creative Scotland’s Youth Music Initiative and Young Scot have teamed up to consult with young people across Scotland, aged 16 to 26, to find out what it is they really want and need to know to help them engage with the music industry in Scotland. If you fit into this age bracket, then completing this survey could result in winning £50 of iTunes vouchers. When does a lesson become a sound check? When many variables have to be investigated. David – now starting S6 at Knox – is to receive the Higher Music prize next week, in addition to the Michael Godek Memorial Guitar Prize. He is also to perform the Prelude from Bach’s Cello Suite No. 1 BWV 1007 – one of my favourite pieces. To avoid feedback problems, in what needs to be an amplified situation, he has been kindly lent a Yamaha Frame Guitar by my friend and colleauge, Chris Day. So, David & I went to down to the school hall for his first shot of the guitar and to take note of the best guitar and amp settings. Game as ever, David agreed to be recorded on this first shot and for me to post the recording. Last night saw East Lothian’s Showcase Concert 2010 – featuring String Ensemble, Percussion, Jazz Band, Guitar Ensemble, Wind Ensemble. This is quite a high-pressure time of year for many pupils. In addition to SQA performances, many have their own school concert and the Showcase Concert all in close proximity. In the case of guitarists, this amounts to 4-6 minutes of solo music for Standard Grade or 10 minutes for Higher; one piece for the school’s Spring Concert; three other pieces for the Showcase Concert. Those from NBHS taking part in the performance for the Head Teachers’ Conference had another four songs to keep in shape. This is an impressive amount of plate-spinning at a time when portfolio deadlines loom. (hats off to David & Callum from Knox for their improvised solos in the last two items). On Friday 29 Jan a group of 7 North Berwick High School guitar pupils gave, along with Zoe (singer), a performance of two songs at the PTA Burns Supper. While the performances were very good, and very well received, the recordings were not great – it was a live event, after all. So today, we met in the cathedral-like acoustic of the Dance Studio to make studio recordings. The final mix was luck – the placing of a Zoom H2 in the middle of the studio and distancing people by intuition more than science. I hope you’ll agree that the result and, more particularly, the performance of the pupils is a success. Thanks to the PE Dept. for their hospitality. It’s worth remembering that these recordings came at the end of a school day, which had already featured a lunchtime rehearsal (of other material) and that the pupils went straight to record without further run-through. It may be my imagination, but I sense a difference in feel between live and studio events for pupils: the former is all about energy, communication and the moment, while the latter is more about focus, attention to detail and posterity. My friend Martyn McQuade, whom I met in P1 at St. Mary’s Primary School in 1965, runs a studio near Longniddry. He recently offered me some free recording time. I thought it would be nice to capture a few of the songs in which I’d recently accompanied Zoe, of NBHS, in various public appearances. Zoe will be appearing, along with seven guitar pupils, in two further Burns’ Songs at the NBHS PTA Burns Supper this coming Friday (29 Jan). Featuring the Robert Black Ceilidh Band, speeches from senior pupils, piping and highland dancing, this is always a great night. Thanks to Martyn for his recording and mixing savoir faire. Having a pair of trustworthy ears at the desk is priceless. Always a source of fascination, Radio 4 is launching Vox Project – researching the oldest instrument on Earth – the human voice. Listeners/readers are invited to send recordings of their voice, engaged in one of various comparative tasks, to the researchers at UCL. The one which particularly interested me (and possibly many of you) is the difference in one’s voice when teaching as opposed, say, to chatting to friends. Schools are full of digital recorders now so why not get involved. an interesting article entitled Why do human voices sound the way they do? I’ve said it before but I’m often struck by how important our voices are in teaching and how little we really know about them. Or is it just me?